President Hugo Chavez made a surprise return to Venezuela today, with enthusiastic crowds cheering his arrival after a two-month absence for cancer treatment in Cuba. The Venezuelan leader returned at 2.30am, accompanied by acting president Nicolas Maduro, who Mr Chavez named as his successor in the event that his illness prevented him from returning to power. President Chavez tweeted after landing in Caracas: “We have arrived in the Venezuelan fatherland. Thank you, my God! Thank you, my beloved people. We continue the treatment here.” The news spread quickly through the streets of the capital, where car horns and fireworks announced the leader’s return. The 58-year-old’s reappearance comes after the first photographs of him in two months were released on state television channel VTV on Friday. The pictures showed the President smiling from a hospital bed in Havana, flanked by his daughters Rosa and Maria. Mr Chavez’s prolonged absence – and the government’s refusal to disclose the exact nature of his cancer – had started to cause jitters in Venezuela, with students last week protesting outside the Cuban embassy, accusing Havana of meddling in the country’s affairs. But there was jubilation among the leftist president’s supporters. A large crowd gathered outside the San Martín military hospital in western Caracas to show support for their ailing leader, who was taken straight there. “I cried from happiness when I heard”, said Campoverde Bolívar. “I have been here since five o’clock this morning to show support…”. 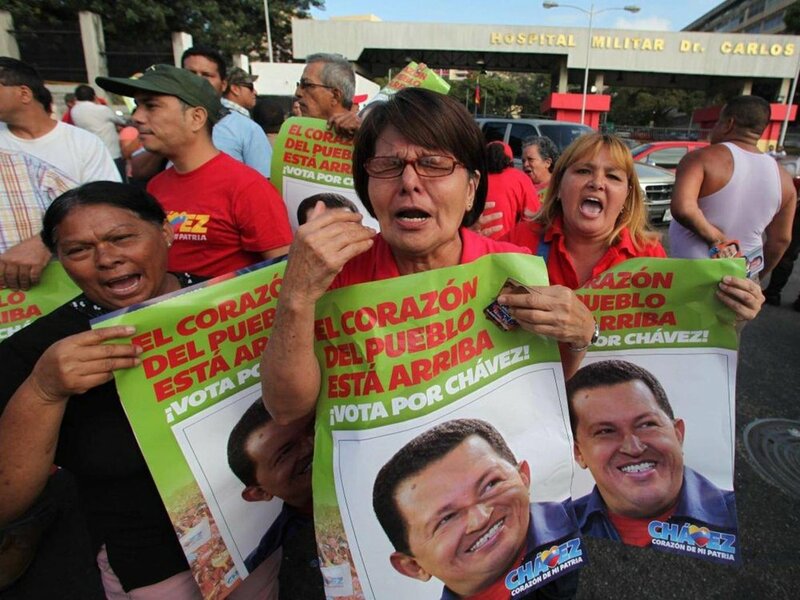 Outside the military hospital, trucks with enormous sound systems blasted out the soundtracks from Mr Chavez’s recent re-election campaign, while hundreds dressed in the red of Mr Chavez’s political party danced and chanted in the street. In the more affluent districts of eastern Caracas – opposition strongholds – the mood was more sombre. “It’s a comedy”, said Luigi, a businessman in the Altamira district. Others were less critical. “I don’t support Chavez”, said José Luis, another Altamira resident, “but his return can only be good for the country. We have spent two months in doubt. No one knew what was going on. Now that the President is back, the country can try to move forward rather than being in this ridiculous state of not knowing anything”. The Venezuelan government has given no indication as to when or whether Mr Chavez will resume his duties. He has still not been officially sworn in as President, after he won re-election last year. Before undergoing his fourth cancer surgery since he announced his illness in June 2011, he nominated his successor as Mr Maduro, a former bus driver. If Mr Chavez does not resume power, a new election will be held. Henrique Capriles, who lost his presidential bid in the October elections, will be expected to stand against Maduro for the presidency.